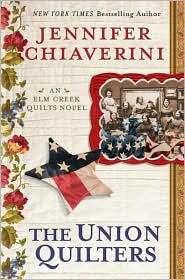 I’ve been reading Jennifer Chiaverini’s Elm Creek Quilt novels for years, and for the most part I’ve enjoyed them all….until I read “The Union Quilters”. This book is set during the American Civil War (1861-1865) and the author tries to incorporate some of the familiar characters from previous books into this one. Unfortunately, it just doesn’t work. This book should never have been written as an Elm Creek Quilts novel. Since the author is obviously intensely interested in Civil War history, she should have, in my humble opinion, just written this book as a remembrance of the Civil War in Pennsylvania. The amount of detail in regards to the movement of various armies and all their leading officers is not only overwhelming, its just plain boring. I sure hope Ms Chiaverini is done writing about the Civil War. I think everybody is ready for her to get back to the winning combination of modern day, the escapades of the Elm Creek quilters, and the Elm Creek quilt camp. Unless you are a SERIOUS CIVIL WAR buff and interested in Pennsylvania history, I’d definitely skip this book. On another note, I can only say great things about the reader/narrator of ALL the audio Elm Creek Quilt novels, Christina Moore. She makes listening a pleasure! However, even her fantastic narration couldn’t keep me interested in “The Union Quilters”.